The content in this section tells the story of the journey to Bad Berka and getting treatment at the Zentralklinik through photos and video. We have combined our experiences with those of other patients and clinic staff to provide the viewer with the visual side of key aspects of this journey made by patients, family and caregivers. Please let us know if you have suggestions for new content or area for improvement. 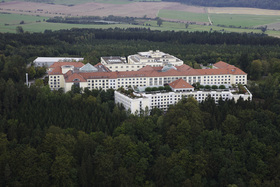 The Zentralklinik is a large 500+ bed medical center complex. 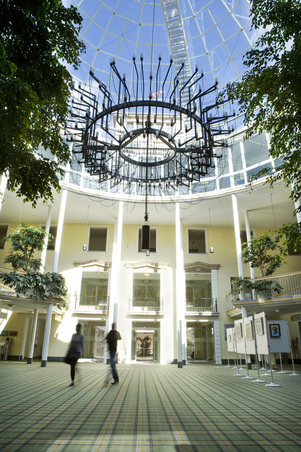 It has well maintained grounds and some unusual buildings. One building is located across the way from the Nuclear Medicine Ward and can be seen from some of the windows in the ward. 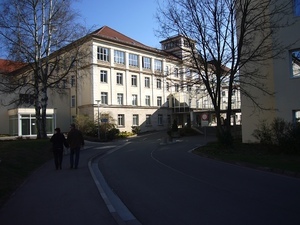 This particular building has a large area – several stories in size that looks like a patient and/or staff lounge. 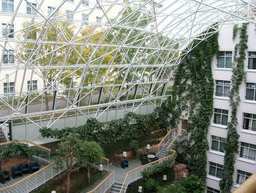 It is built like a large atrium with multiple floors that are below ground level. 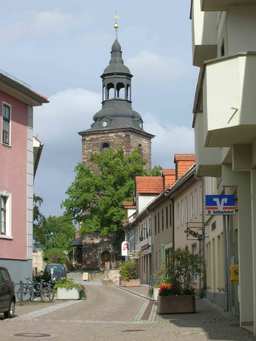 The town of Bad Berka is small as towns go. According to Wikipedia it has about 8,000 residents. It takes about 15 minutes or less to walk the main street of the town from end to end – and that is walking slowly. If you stop at the Ice Cream shop it will take a little longer! From the perspective of the patient waiting to go for treatment or waiting to return home, the town offers a few things to do. This is a photo guide of what to look for when you take the train from the Frankfurt airport to Weimar on your way to Bad Berka. Please note that depending on the season there will be a nonstop train to Weimar or you may need to transfer at Erfurt. 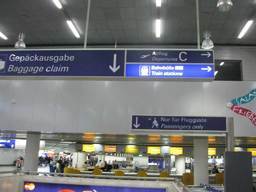 When you get off the plane at Frankfurt and you have cleared Passport Control, start looking for the direction signs to the train station that is just adjacent to Plane Terminal 1. You will see signs like this one.